In the West, you celebrate with champagne. But for Chinese people, cognac's for celebrating. Cognac has a strong celebratory connotation among Chinese consumers, and so for Chinese New Year, Cognac bottles are a hugely popular gift. But in a gift category that's oversaturated during the holidays and dominated by Hennessy X.O. 's flashy limited edition bottles, how can Martell stand out as the brand of choice for younger, more experience-driven, Chinese drinkers? We turned the gift of a bottle into a blessing for the new year. We were inspired by a centuries-old tradition that began here in Hong Kong. During Chinese New Year, villagers would travel for miles to visit the Lam Tsuen Wishing Trees, two ancient banyan trees near the Tin Hau Temple. Traditionally, celebrators would burn joss sticks before writing their wish on a red paper, tying it to a mandarin, and then throwing the wish up to hang in the branches of the trees. Today, people are no longer allowed to throw wishes into the Lam Tsuen Trees, but some still visit the village every year to tie their wishes to wooden support beams, imitation trees, or even the racks surrounding the original wishing trees. We are fascinated with Hong Kong's unique way of preserving traditions, and wanted to use our campaign to match an old practice with contemporary gifting behaviour. We also wanted a style that referenced traditional Chinese art, but was Western in spirit and execution. design needed to be relevant to our target audience without losing any of the French spirit that makes up Martell as a brand. We collaborated with Sabrina Transiskus, a talented papercut artist, and worked to combine her own Western papercut style with the strong outlines and vibrant colours of Chinese papercut art. 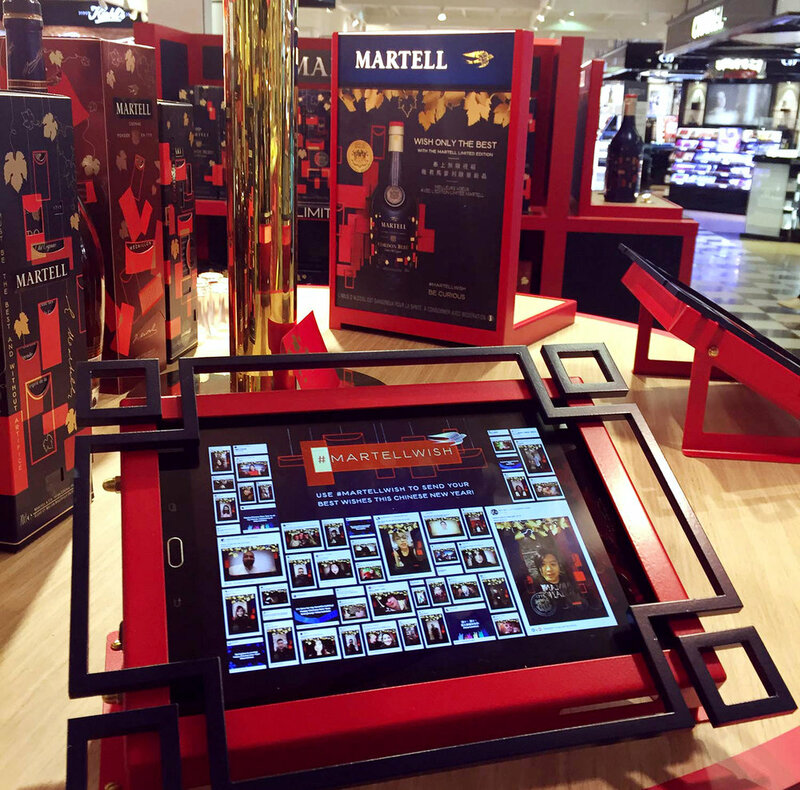 We created a simple activation that turned every gift of a Limited CNY Martell bottle into a personalised wish for the New Year. By scanning the unique QR code on their bottle, purchasers could record a blessing before giving their gift to a loved one or colleague. The wish would play automatically the next time the QR code is scanned.